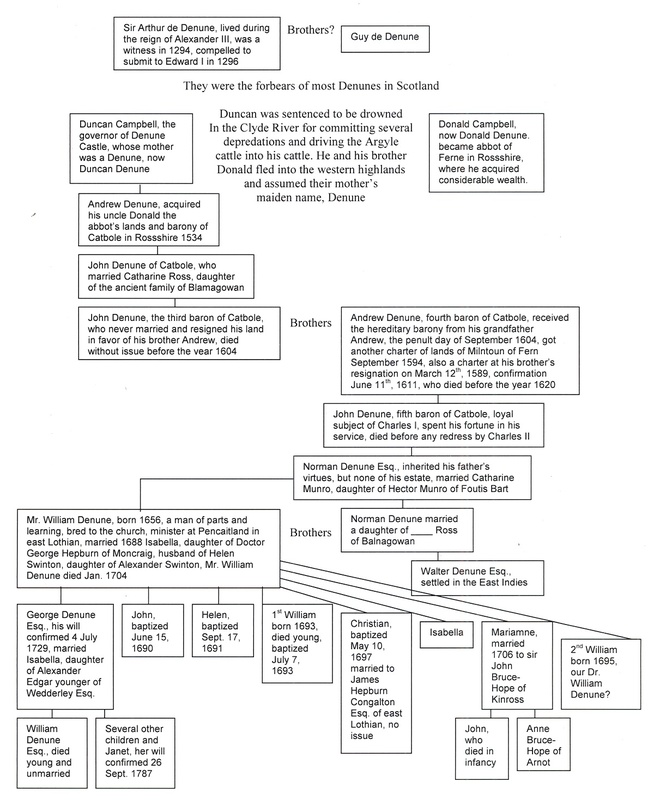 The Baronage of Scotland, Denunes of Catbole, &c.
This is a diagram illustrates the early Scottish ancestry of Dr. William Denune, the emigrant, and is drawn from The Baronage of Scotland, 1798. The sirname Denune is of great antiquity in Scotland, is local, and was assumed by the proprietors of the lands and barony of Denune in Argyleshire, as soon as sir names became hereditary in this country, though these lands afterward became the property of the family of Argyle. Sir Arthur de Denune, flourished in the reign of King Alexander III, and had the honor of knighthood conferred upon him by that prince, whom he survived several years. In a charter of James Lord High Stewart of Scotland, confirming the donations of his predecessors to the Monastery of Paisiey, the witnesses are, "Robert bishop of Glasgow, John brother of the Lord High Steward, Sir Arthur de Denune, Sir Nicholas Campbell, and Sir Reginald de Crawford, knights, William de Shaw, Alexander de Normanville, &c. esquires," anno 1294. This Sir Arthur was afterward, with many of his countrymen, compelled to submit to King Edward I of England, anno 1296. Whether Sir Arthur de Denune and Guy were brothers, we cannot determine, but it’s believed that, of these two, most of the Denunes in Scotland are descended, whose posterity have been free barons in different counties of this kingdom, some centuries ago. The lands and Castle of Denune have been long the property of the family of Argyle, as before observed. They have a tradition handed down by their bards and sennachies, which is still believed, viz. That a younger son of the family of Argyle was appointed heretable governor and keeper of the Castle of Denune. Duncan Campbell, one of his posterity, having had some feuds with his neighbours, also vassals of Argyle, committed several depredations and drove their cattle into his cattle, &c. which the earl of Argyle highly resented, and had the governor, though his kinsman, tried, condemned, and ordered to be drowned in the water of Clyde, &c. However, Duncan had the good fortune to make his escape, and fled to the north country, where he settled, and his mother having been a daughter of the family of Denune, he assumed that for his sirname, which his posterity enjoyed ever after, but they retained the armorial bearing of the Campbells, their paternal ancestors. This Duncan had a brother, Donald, who accompanied him to the north, and also assumed Denune for his sirname. He being bred to the church, and a man of parts and learning, became abbot of Ferne in Rossshire, where he acquired considerable wealth. Norman Denune Esq; who inherited all his fathers virtues, but little or none of his estate. He married Catharine, daughter of sir Hector Munro of Foulis Bart, by whom he had 2 sons, 1) Norman. 2) Mr. William, of whom more afterwards. Norman Denune, eldest son of the above Norman, married a daughter of ____ Ross of Balnagowan, by whom he had a son, Walter Denune Esq; whose only son ____ is settled in the East Indies. Mr. William Denune, second son of the first Norman, a man of parts and learning, and being bred to the church, was minister of the gospel at Pencaitland, in East Lothian, where he married Isabella, daughter of Doctor George Hepburn of Moncraig, Esq; by Helen his wife, daughter of sir Alexander Swinton of that ilk, and by her he had one son, George; and several daughters, 1) Christian, married to James Hepburn Congalton Esq; chief of the ancient family of the Congaltons of that ilk in East Lothian, without issue, 2) Mariamne, married to sir John Bruce-Hope of Kinross, baronet, by whom she had one son, John, who died in infancy, and a daughter, Anne Bruce-Hope of Arnot, who is now heir of line of the Hopes of Craighall, Bruces of Kinross, &c. Mr William’s other daughters died unmarried. George Denune Esq; his only son married Isabella, daughter of Alexander Edgar younger of Wedderley Esq; by whom he had one son, William Denune Esq; a youth of great hopes and spirit, who died in the flower of his age, unmarried. George had several other children, of whom there is only one daughter, Janet, surviving.